From the REEDS Exclusive ECONIC Diamond collection, this stunning 14k white gold bridal set features an engagement ring and matching band for the perfect and complete wedding ring set for her. The engagement ring boasts a sparkling round brilliant ECONIC lab grown diamond that is surrounded by round lab grown diamonds in a halo design. Completing the sparkle and shine of the engagement ring, additional round lab grown diamonds accent the shoulders of its split shank style band. 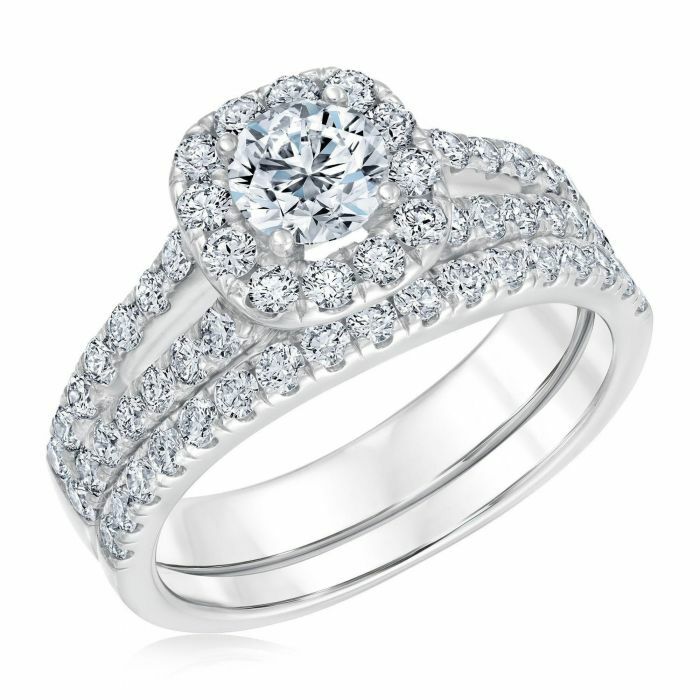 Seamlessly matching the engagement ring, the wedding band is adorned with a row of sparkling round lab grown diamonds. The center diamond of the engagement ring is independently graded and comes presented with a graded diamond report* from IGI, the International Gemological Institute. Diamonds are 1 3/4ctw, I in color, and SI2 in clarity. The engagement ring is 9mm across the top and 3.5mm at the bottom and the wedding band is 2mm in width.